Zhanhu Guo is Associate Professor in the Department of Chemical and Biomolecular Engineering at The University of Tennessee, Knoxville, USA. He received his PhD in chemical engineering from Louisiana State University, USA, followed by postdoctoral studies in mechanical and aerospace engineering at the University of California, Los Angeles, USA. He was the Chair of the Composite Division of the American Institute of Chemical Engineers in 2010-2011. 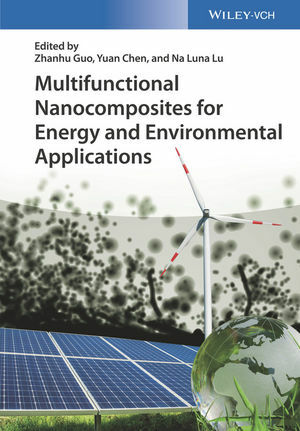 Dr. Guo's Integrated Composites Laboratory focuses on multifunctional nanocomposites for energy, environmental and electronic devices applications. Yuan Chen is Professor in the School of Chemical and Biomolecular Engineering at The University of Sydney, Australia. He received his PhD in chemical engineering from Yale University. Before joining The University of Sydney, he was Associate Professor at Nanyang Technological University, Singapore, where he served as Head of the Chemical and Biomolecular Engineering Division in 2011-2014. His research focuses on carbon nanomaterials for sustainable energy and environmental applications. He received several awards including Australian Research Council Future Fellowship in 2017 and Young Scientist Awards by the Singapore National Academy of Science in 2011. Na (Luna) Lu is an associate professor of the Lyles School of Civil Engineering and School of Materials Engineering at Purdue University. She has research interests/ expertise in using nanotechnology to tailor a materials? (electrical, thermal, mechanical, and optical) properties for renewable energy applications, in particular, thermoelectric, piezoelectric and solar cells. Fundamentally, her group studies electron, phonon, and photon transport mechanisms for a given materials system, and designs the transport properties to meet the targeted performance. Her research work has been featured in national and regional media. She is the recipient of a 2014 National Science Foundation Yong Investigator CAREER Award.